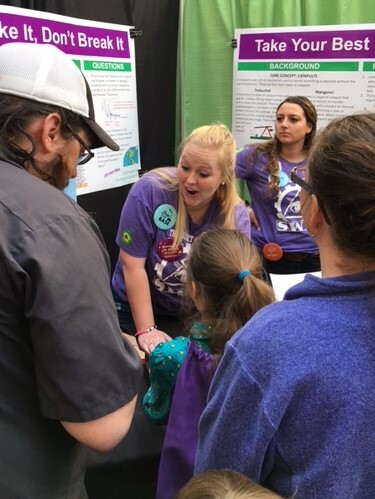 Every October, the Mines student section of the Society of Women Engineers (SWE) hosts over 100 Denver-area Girl Scouts for Girl Scout Engineering Day (GSED). Hands-on activities introduce 4th-6th grade girls to the opportunities that are available to them in the fields of math, science, and engineering. The girls attend stations with several engineering stations, participate in making asphalt cookies, and playing science and engineering games. Each February, the Mines student section of the Society of Women Engineers (SWE) hosts an engineering and leadership conference geared toward getting high school girls interested in pursuing STEM fields. The conference showcases nine different engineering majors, college peparadness, professional dress, and networking opportunities. For more information see the flyer, to enroll go to the Mines SWE website. Contact Agata Dean for more information. This recruitment program for women undergraduate students brings accepted high school students and their parents to campus to make a connection to current women at Mines including students, faculty, staff and alumnae as well as other prospective women students. The program encourages a sense of community, helps prospective students learn about the engineering process and working in teams, and introduces them to sponsor Halliburton and their commitment to women in STEM. For more information, contact Annette Pilkington. GE Girls Camp is sponsored by General Electric, and hosted by Colorado School of Mines. This camp is a program designed to encourage girls to explore the world of science, technology, engineering and math , and STEM-based careers. The Mines Multicultural Engineering Program (MEP) offers several pre-collegiate programs designed primarily for middle and high school students. Visit the MEP website for further information and registration.